These modules have been around for a while, but they fascinate me. 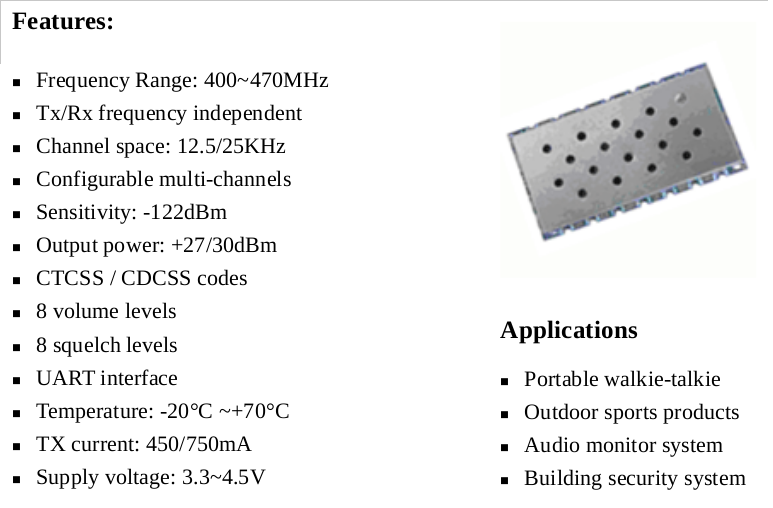 For only US $12,88 you get a fully functional 1 Watt transceiver working on either VHF or UHF. The last letter in the model number tells you which version it is. 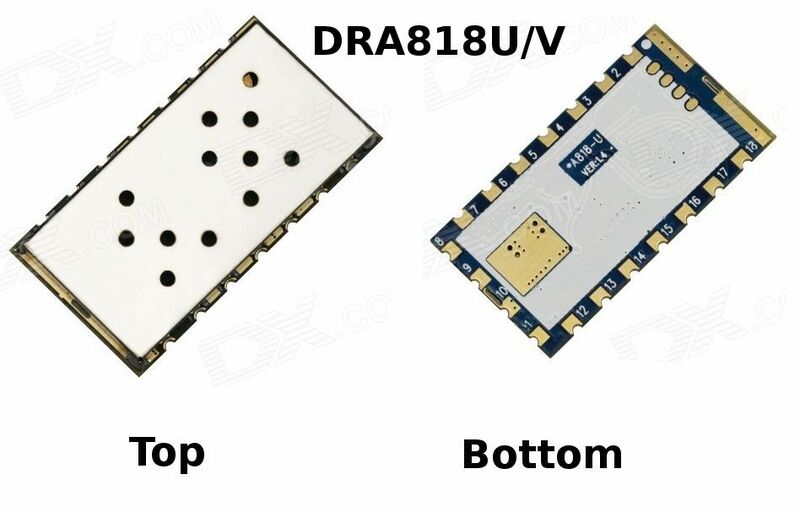 The modules are available on eBay from seller Dorjigroup (link). 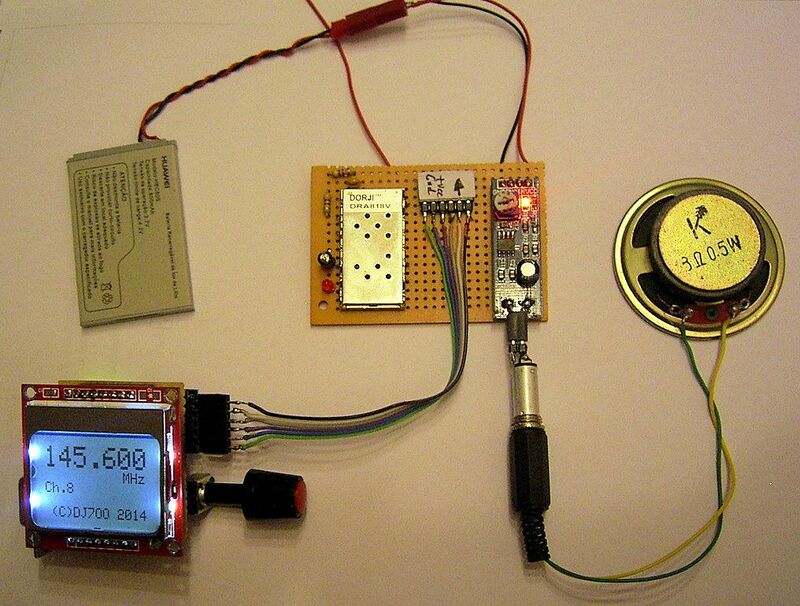 In combination with an Arduino you can build a full-featured transceiver. And how about a 16-channel version with a Nokia display attached? For more information on finished projects go to http://www.kh-gps.de/dra.htm, where you can find schematics and example Arduino code. Raspberry Pi 2 yesterday, now this today? I think Christmas came early this year! I need councilling I can’t keep up! Lets us know if you do some testing with this board. I’m looking for a remote control PMR for ages…a redio that I could control by software in all his functions, installed on a PC that I would remote control…. Avond, lijkt op deze module maar is toch weer anders. Leuke dingen, maar wel een heel goed LP filter achter zetten. Meet maar eens met een spec. , en schrik hoe sterk de harmonischen zijn. Vooral van de VHF versie. If anyone could mess this up, it would be me! The modules I ordered on eBay arrived in less than two weeks, and I plan on playing with them when I get the time. Brilliant!!! Looks great for making some cool projects (I’m currently thinking of making a mobile phone app which can control a TRX over bluetooth). Thanks for the tip Hans! 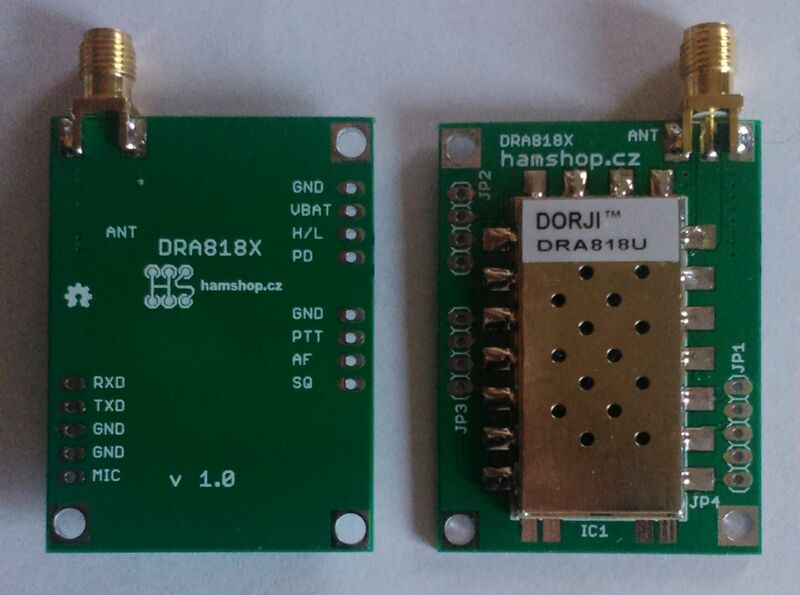 I just wish they’d have modules like these with the RDA1847 instead, that one has I/Q SDR input/output. That way we could even build all-mode TRXes with digital modes and SSB. Personally I would have preferred them to have used a standard 2.54 mm distance between pins/connectors. It would make it much easier to solder it to a standard protoboard. Personally I have no plans on trying to use these for any SDR project, I would be quite happy to make a decent APRS tracker having it connected to a Teensy 3.1. 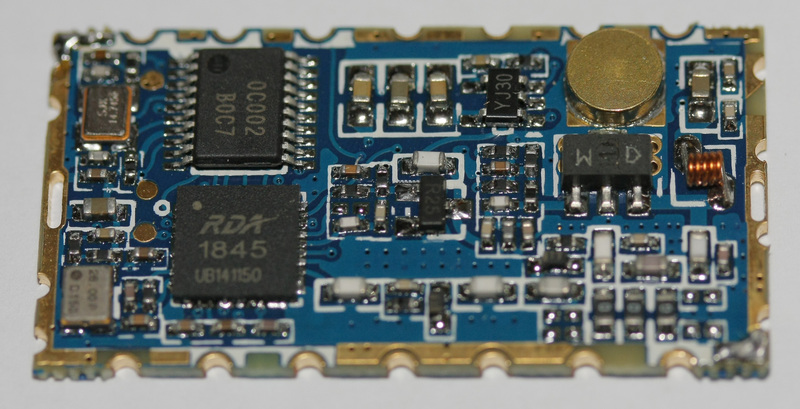 And indeed there is no point in even trying with these, the RDA1845/1846 is only an SDR internally: It does not expose the raw data outside. That will only ever work with a module based on the RDA1847. 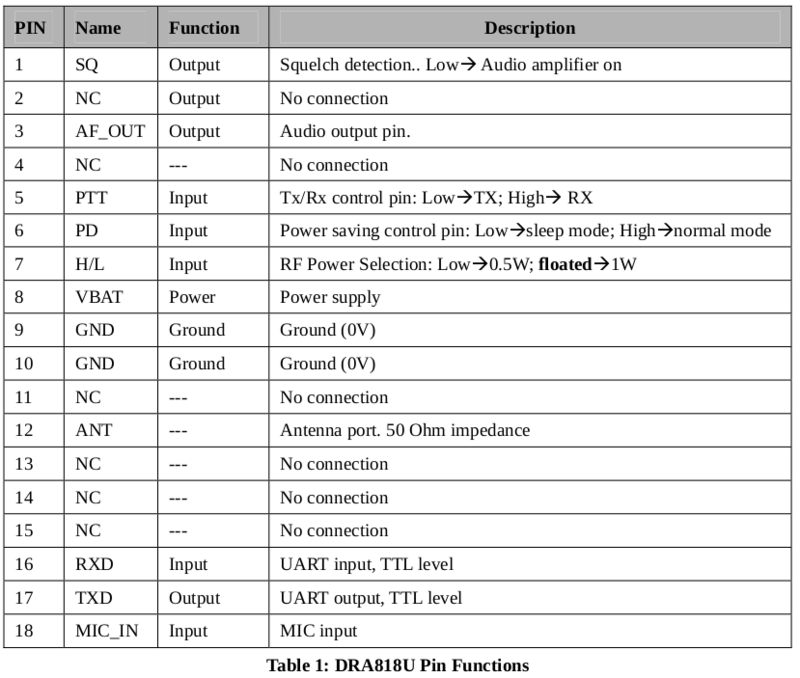 By the way, I read on the site Hans mentioned (http://www.kh-gps.de/dra.htm) that you need to use at least 1 second TXDelay with APRS (1.2s is what they advise) which is very long. So it doesn’t sound too great for APRS either unfortunately, it probably takes a while for the transmitter to come up, which is not handy on a packet switched protocol. Ok never mind, the box73 shop linked above still has them 😀 Thanks Ron! 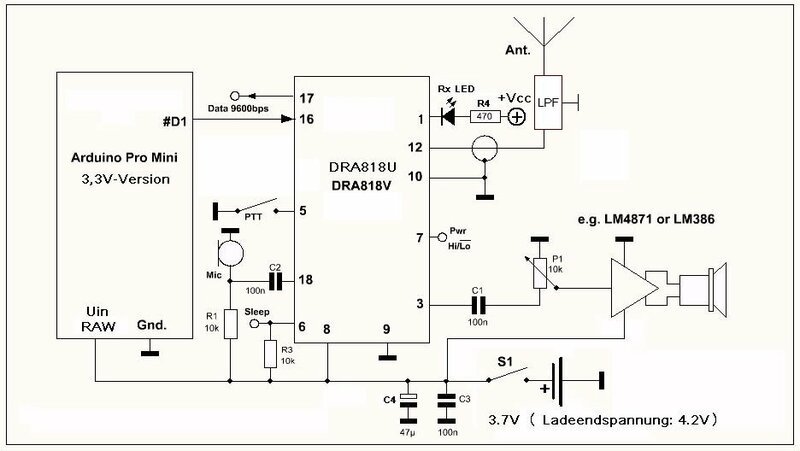 GekkePrutser: The TXdelay should not be a problem, I think. With APRS I expect to send a few times an hour and spend the rest of the time receiving, it’s not a high speed two way data link. Let’s say I want to send some information every 15 minutes, that’s once every 900 seconds. If I spend one second waiting for the radio module to stabilize I loose about 0.1 % of possible reception time. I plan to use the squelch output from the module to determine whether to transmit or not. 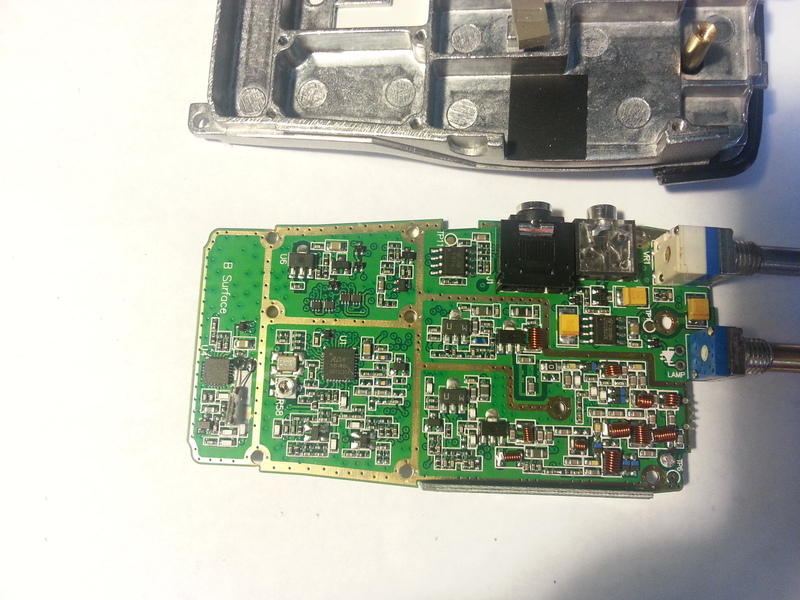 I want to make a VHF receiver for Australian Narrow band radios to listen those stations. I did the construction with Arduino but the quality of the audio is very bad. I tried all the filter compinations (de-emphasis/Low/High) but the problem is still there. An other problem is that the squelch still cutting out the audio even it is set to “0”. Have you any ideas?